A small pack of live action upgrades of Disney’s The Jungle Book has emerged from the undergrowth, blinking nervously, on a few previous occasions. With mixed results. Any film in the shadow of one as classic, as loved as the ’67 original is surely setting itself an unattainable goal. And surely knowingly so. Perhaps for that reason, a fully animated reboot of the definitive allegory of dawning adolescence has never been attempted. At very nearly a half-century since the release of their most fondly regarded offspring, a fresh retelling of Kipling’s myth has now been set free. One that aims to blur the line between the artificial and the real. This fearsome task falls to Jon Favreau, purveyor of such wide-appeal favourites as Elf (2003) and Iron Man (2008). Someone who’s made enormous successes of projects as varied as a cheeky Christmas caper and the bombastic smash that ignited the mammoth Marvel franchise is probably one of the few directors qualified to take on a task of such elephantine ambition. An imaginary menagerie is brought to life in exquisite detail. Setting a tone entirely distinct from the original, the photo-realism feels as far developed from the cartoon as an accomplished adult looking back on their childhood paintings with a bittersweet fondness. The implication is that CGI has finally evolved enough to render the extraordinary detail required. The result is a curious mix of uncanny depiction of the animal kingdom and the whimsy of Kipling’s enduring fable. But does it have the heart? The exuberant Neel Sethi, the sole real-life actor with the run of this tropical dreamworld, carries the emotional core at a soberingly young age. And impressively so, with a fitting blend of naivety and burgeoning maturity. Watching him against an entirely fabricated backdrop, some compositions feel a little contrived. 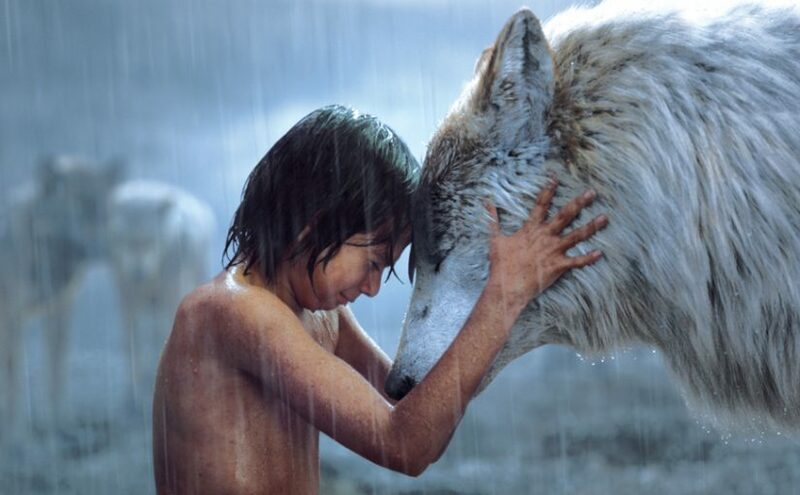 A painterly touch only brings the movie’s cuter ancestor to mind, though, emphasising the extent to which animated techniques have bounded forward in the intervening years. It may have nothing to do with the superhero juggernaut that Favreau helped launch, but this really is something to ‘marvel’ at. The casting of Idris Elba as Shere Khan is spot on. Every word exudes a perfectly pitched menace, making for one of the most satisfying screen villains of recent times. Scarlett Johansson is less successful at reimagining lithping hypno-therpent Kaa. It’s one instance where this update will never measure up to its predecessor. Meanwhile Bill Murray is as gloriously lackadaisical as you would expect as Baloo, laid-back mentor gently introducing Mowgli to the uncaring harshness of the world outside the safe cocoon of a mother’s care. The decision has obviously been taken to tiptoe around the pitfalls of conventional ‘musical’. The songs we know are used …but playfully …and only partially. Weaved in gently or wryly referenced, they too work …partially. Kaa’s ‘Trust In Me’ was always onto a loser, and is relegated to the end credits. Something as bold as Christopher Walken’s deliberately frightening take on King Louie, however, succeeds in reinventing ‘I Wanna Be Like You’ in an effectively counter-intuitive way. The vertiginous climax, of the type demanded by family fare such as this, feels a little predictable, and disappoints. Yet the overriding emotion wins out. This is a suitably wondrous introduction to an evergreen classic. Of course it will never last in the manner of the cartoon masterpiece. But this is an update unafraid to rise up on its own two feet, stand tall, and manfully square up to the most audacious challenge.